What to expect: Right in the heart of Coconut Grove, this hidden gem is the perfect getaway spot for a date night or business lunch. They have a large courtyard with tables and umbrellas to dine at whenever Miami gets blessed with that cool 70s weather we love. Don’t want to leave your dog at home? No worries, they’re dog-friendly. You can order from a separate menu for the pooches, or treat them to a complimentary treat just outside the door. 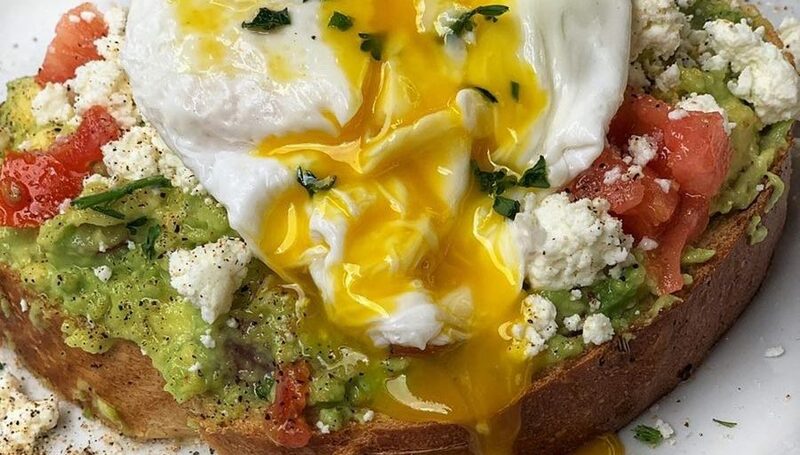 The Menu: The Spillover launched a new brunch menu, and they left no item behind. From pop tarts to hanging bacon, the menu has something for everyone. Broken out into sections of appetizers, main plates, lunch items, and a sweets section, you’re just about guaranteed a decent meal. Don’t Go Bacon My Heart: (YES ELTON) What bacon lover’s dreams are made of. 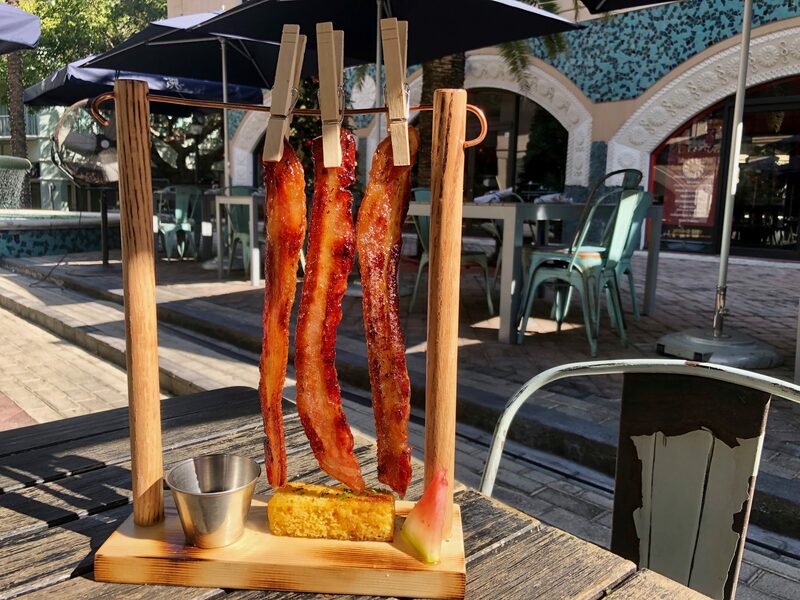 Hanging on a line like your freshly washed laundry, this appetizer comes with three slices of thick-cut, smoked Applewood bacon candied and cured in-house with brown sugar and served with maple syrup and a slice of cornbread. If you’re willing to share, this item is a good starter for two. 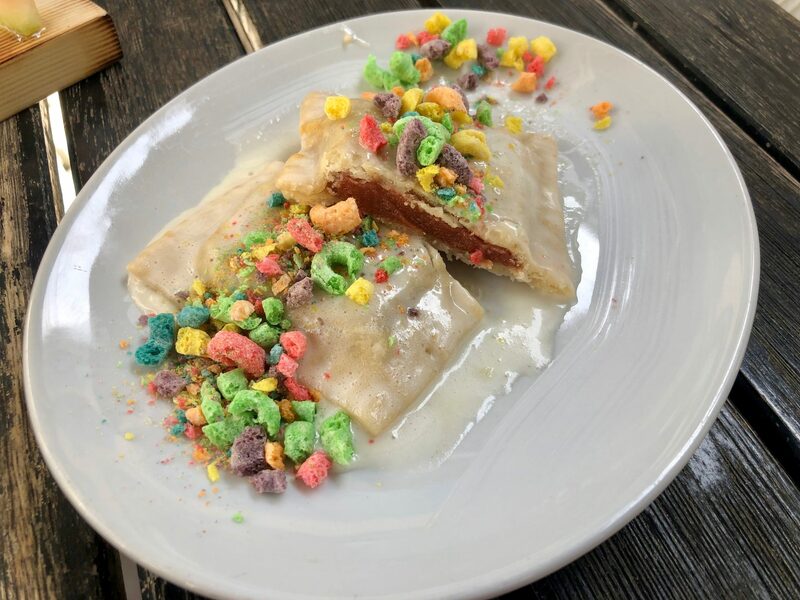 Homemade Pop Tarts: Your childhood-self called and they’re requesting this throwback breakfast item pronto. The twist on this 90s classic is filled with guava, brushed with homemade frosting, and topped with fruit loops. What more could you ask for? Perfect for someone with a sweet tooth. You Are My Everything Bagel: Their spin on the ‘bagel and lox’, this dish is anything but traditional. 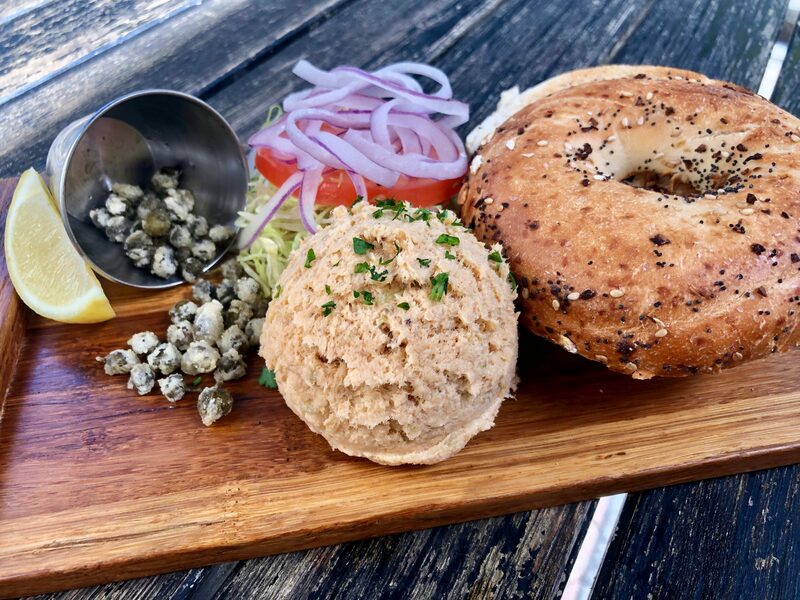 Completely deconstructed, here is the breakdown: a toasted everything bagel, a scoop of house-smoked whitefish (which has a bit of a kick), fried capers, lettuce, thinly sliced red onions, and the tomato on top with drizzled Lokal Vinaigrette. 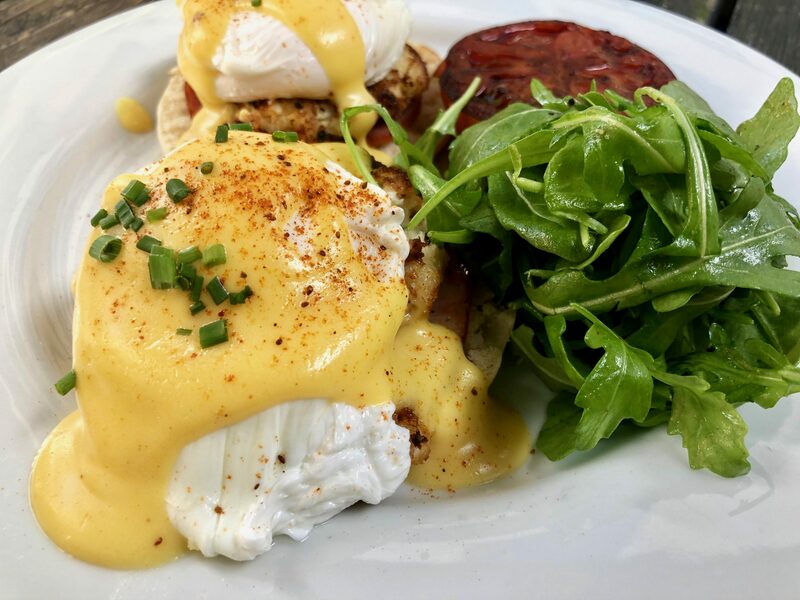 Crab Cake Benedict: Bursting with flavor (and yolk) this is an item not to miss. An English muffin topped with grilled Canadian bacon, poached eggs, and hollandaise sauce with a sprinkle of Old Bay. To accompany your Benedict, you’ll get an arugula salad with balsamic vine ripe tomato. Not in the mood for crab cake? For an upcharge, you can opt for other protein selections such as Cajun shrimp or lobster. Zenobia’s Bloody Mary: Certainly not your average bloody mary. 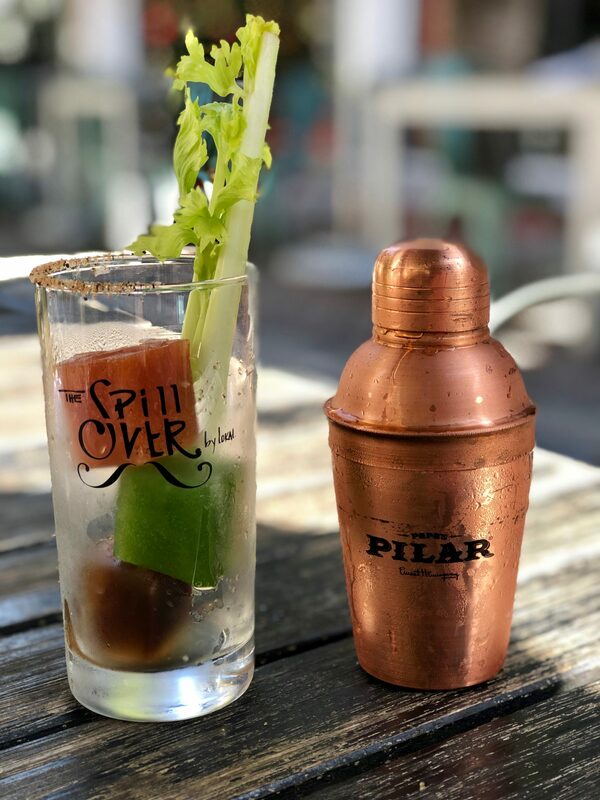 Winning their “Most Instagram Worthy” cocktail award, this drink comes in your own personal brass shaker. In a separate glass to pour your beverage, you’ll get three ice cubes each one filled with something different: Worchester, tomato, celery jalapeno. This is a hot item to order if you don’t want to feel left out. Ginger Prosecco Mojito: Winning the “Most Refreshing” award, this cocktail does not disappoint. 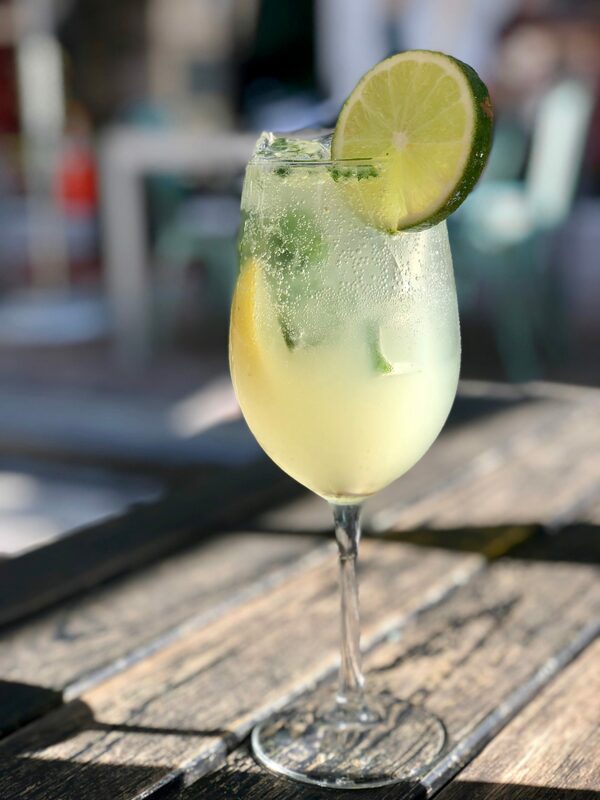 Filled with Hendricks gin, lavender, mint, ginger beer, and prosecco, it’ll be sure to cool you down on a hot Miami day. How to score a table: Call ahead for a reservation, or walk-in. They have plenty of indoor and outdoor seating.